National and international health organizations’ statements on recovery and cognitive skills support the basic Narconon principles of drug rehabilitation. Rehabilitation means that a person must not only recover from the physical damage of addiction, he must also change his life. For more than forty years, Narconon drug rehab organizations have operated with core principles based on developing life skills in their students. These concepts are now gaining increasing support from national and international health organizations. Both the World Health Organization (WHO) and the US Substance Abuse and Mental Health Services Administration (SAMHSA) have issued statements about the necessity for targeting life skills, including cognitive and social skills, in drug rehab. To educate families on the importance of life skills in addiction recovery, Narconon International has recently added an educational feature on life skills to its website. This new feature contains more than two dozen short explanatory articles that illustrate how the Narconon rehab program aligns with principles stated by the WHO and SAMHSA. "From the earliest days of the Narconon drug rehab program, our core concept has been a focus on life skills," said Clark Carr, president of Narconon International. "William Benitez, the man who founded the program inside Arizona State Prison system, used books by L. Ron Hubbard to teach himself and other inmates how they could better solve problems, more successfully manage their lives. As their life skills realistically improved, their addictions would 'drop by the wayside,' to use Benitez's own words." In the WHO record of that meeting, the participants clarified the relationship between life skills and abilities: "Skills are abilities. Hence it should be possible to practise life skills as abilities. Self-esteem, sociability and tolerance are not taught as abilities: rather, learning such qualities is facilitated by learning and practising life skills, such as self-awareness, problem-solving, critical thinking, and interpersonal skills." Community, including relationships with friends and social networks that provide support and love. "Our decades of experience working hands-on with tens of thousands of recovering substance abusers fully support these statements by the WHO and SAMHSA," said Carr. "Rehabilitation means that a person must not only recover from the physical damage of addiction, he must also change his life. That is, he must improve his life skills, really and truly, for use in the crucible of everyday existence. Our Narconon programs have always been strongly oriented toward this by the inclusion of a thorough life skills education component." 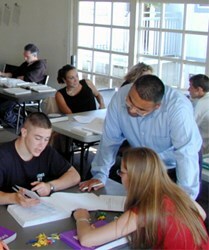 For a description of some of the Narconon life skills educational materials, visit: http://www.narconon.org/drug-rehab/skills/. For information on the Narconon drug rehab program, call 1-800-775-8750.